WITH LOVE TO ALL OF MY DEAR AND WONDERFUL READERS AND FOLLOWERS OF MY WEEKLY BLOGS….!!! Hey! It’s me, your Mary Ann-san from Hilo, back with you again! Are you ready to read my newest Blog as I continue to share my Holiday Season you? I hope so because I am so happy to be writing it! So I hope that you have a Happy Read and enjoy. BLOG # 32 : IN THE SPIRIT OF THANKSGIVING !!! My Dear Ones! This is the time! This is it! 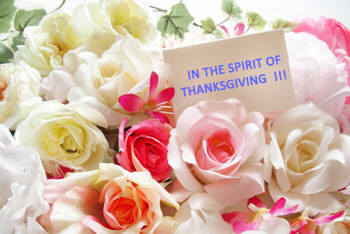 I am writing this Blog during the all-important last weekend before our BIG HOLIDAY—THANKSGIVING DAY! And yes, My Dear Readers, if all of you are wondering, I did get all of my Thanksgiving Cards out in time. I say this with great happiness because all 21 of them were mailed on the 15th— a day later than your Mary Ann-san had planned. I had planned on writing them all out on Sunday, the 12th and finishing them on Monday, the 13th and mailing them all out on the 14th. Sad to say, due to my (Shoulder) ,arthritis pain, no cards got written until Monday the 13th and I did them all at one time but dated them for the 15th so I could mail them out at the Downtown Hilo Post Office. That way I would be SURE they would all go out. (Ever since our regular Postman and friend for the area where I live retired, I personally, do not trust the temporary Postal People who have been delivering the mail here and we do not have a permanent Postman as yet. But this is definitely a story for another Blog—one soon to come!). Moving right along in my Holiday mood here, I MUST say, with tons of Joy, that the 15th, last Wednesday, was an overly excellent day for me because on that day, I went to the store (my friend drove me) and bought a Turkey. Seventeen pounds. (Actually, in all and complete honesty, the weight of THE BIRD was 16.96 pounds. Like four ounces off but since it is that close we will go with seventeen pounds). But this Turkey I bought was not for me. It was for my Hawaiian Lady-friend (not the one who drove me to the store. She has her own already) and her family as my Thanksgiving Gift to them. I have been doing this for them for at least a couple of years now and when I did it the first time for them they were really shocked because no one had done it for them before. I try to do it for their Christmas Meal as well. (This reminds me, I must try to work out something for their New Years Day as well for them!!). And by now My Dear and Faithful Readers, you are wondering what I get out of doing this—like maybe perhaps—why does our dear Mary Ann-san go out of her way to do this when the family can probably buy their own? Well, I guess you could say it started when I happened to call this Lady-friend and I just happened to ask how her Thanksgiving Day was and how was The Turkey? That was the year they did not have one — couldn’t afford The Bird—-due to a very super tight budget. So, they had had other things. I said: What? What is Thanksgiving Day without the Turkey? And it was right after that that I started to make SURE this wonderful family had a BIG BIRD to celebrate with and eat on the Big Day. I buy THE BIRD for them and put in my freezer until they can come and pick it up. I do this because I love them. And what do I get out of it all? LOVE. And the feeling that I am doing something GOOD for someone. I am also doing it for GOD because when you do something for GOD you just know you are doing the right thing. In fact, GOD has blessed me so well and so greatly this year that I was able to help out my Church this year with a donation to their Thanksgiving Hot Meal For The Hungry (Their Thanksgiving Luncheon held at the Church a few days before The Holiday). Because of GOD and HIS BLESSINGS to me, I was able to donate everything they wanted on their Wish List for the meal. It was the first time I have been able to do this and I was so happy that I could do this that I literally CRIED tears of JOY! And I was so grateful to my lady-friend who drove me to the store and to the Church so I could do this that I offered to buy her a full tank of gas for her car. (However, she declined my offer, even after I begged). But you just don’t know. I feel SO GOOD when I can help someone especially at this time of year—The Holidays. It is a wonderful feeling, let me tell you! To continue, My Dear Readers: The weekend before Thanksgiving Day is also, for some people, a good time to CLEAN. To prepare and decorate the house (or apartment in my case), for the Holidays. And I think that is a terrific thing for me to do—and so I shall—as soon as I finish writing all of you, this PRE-HOLIDAY BLOG. It will take your Mary Ann-san a lot of time to clean and I shall need every minute of it and I will keep at it until it is done. You will notice however, that I won’t be rushing at it even though time is short. That is because I want to spend as much time as I possibly can with YOU—My Dear and Wonderful Readers. I mean isn’t that what this Holiday Season is all about? Being with friends and family and those you love, and those who love you? Perhaps one year soon, WE can celebrate my American Holiday, which we here call Thanksgiving Day together if GOD wills it to be for me and for US.